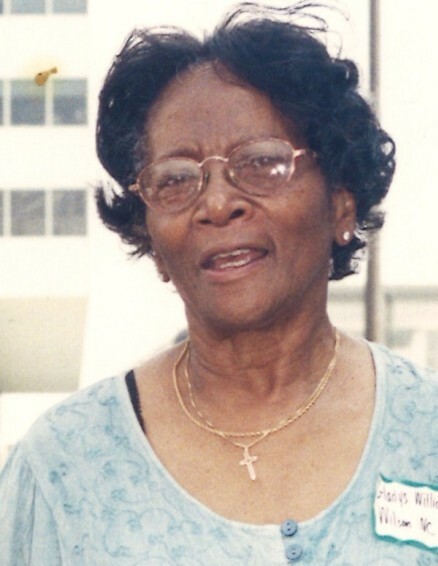 Mrs. Gladys Bea Williams, 85, of 2203 Imperial Ave., Wilson, NC, passed away on Saturday, March 23, 2019 at her home. The funeral service is scheduled for Saturday, March 30, 2019 at 1:00 pm at Saint Rose Church of Christ, 605 South Douglas Street, Wilson, NC. Elder Lynn D. May, Sr., the son-in-law, will do the eulogy and the burial will follow in Rest Haven Cemetery, Lane Street, Ext., Wilson, NC. A public visitation will be held on Friday, March 29, 2019 from 3:00 pm until 6:00 pm at Stevens Funeral Home, 1820 Martin Luther King, Jr. Parkway, The family will receive friends at the residence at all times and will assemble there on Saturday at 12 noon in preparation for the funeral procession. Mrs. Williams was preceded in death by her husband, Frank Williams, Jr.; one daughter, Sheila Delores Williams and her parents, Leroy Foster and Mary Weaver. She leaves many cherished memories to: four daughters, Francine Williams of the home, Angelia Williams , Felecia W. Lucas and Gladys W. May (Lynn) all of Wilson, NC; two sons, Frankie Williams of Kinston, NC and Cedric Bell of Raleigh, NC; a special son, Collier Barnes of Wilson, NC; eighteen grandchildren including, the four she reared, Calandra D. Smith (Carlton), Zaneta Ratley (Tyrone), Larry D. Williams (Crystal) and Talia Hardy; fifty two great grandchildren; thirty nine great-great grandchildren; five sisters, Sadie Weaver of Milford, DE, Flonnie Hobbs of Flushing, NY, Cora Foster Adams of Durham, NC; a host of nieces, nephews, cousins, other relatives and friends. The family will receive friends at the home where they will assemble on Saturday, March 20, 2019 at 12:00 noon in preparation for the funeral procession.